When Tim "Ripper" Owens went into the studio in the summer of 2003 to lay down vocals for Iced Earth's latest album, "The Glorious Burden," he thought it was going to be a one-shot collaboration. After all, he already had a job - singing for metal legends Judas Priest. 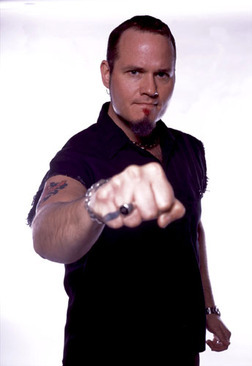 But even then, the rumors were swirling about a Priest reunion with original vocalist Rob Halford, and when the official reunion announcement was made in the fall, Owens decided to make the full jump into his new band. Owens says he felt an immediate chemistry with Iced Earth guitarist and founder Jon Schaffer. "I definitely think that it's something that seems right, and John and I get along so well," he said. "It's a perfect fit." The result of the collaboration "The Glorious Burden," released in January, shows Schaffer's passion for history and has been hailed by many Iced Earth fans as the band's best effort to date. Owens was called in on the project when Schaffer was not happy with the performance of long-time singer Matt Barlow, who seemed to have lost his passion for the music. "The problem is that this album just has so much passion that if you lose your way, you're going to be able to tell," Owens said. Owens himself didn't have that problem. He loves the album, and with Iced Earth, he's already got something he never had in his years with Judas Priest - a writing credit on the track "Red Baron, Blue Max." "Jon actually offered for me to write three different songs before I was even in the band," he said. "It's quite amazing." Owens said he and Schaffer have distinctly different writing styles, and he's already looking forward to what the two of them can come up with for the next Iced Earth album. "It's something that Jon and I talk about all the time," he said. "We can't wait to work together." The singer also got to show some vocal chops that he was never able to showcase on a Judas Priest album. With his former band, he was often relegated to trying to sound like his predecessor, Halford, and never got to stretch his talents like he does with Iced Earth. "The thing about John's writing is that he lets the vocals soar and sing more," Owens said. "This is singing with a lot of emotion. It's definitely more of a showcase for my vocals." But there were some challenges involved in joining Iced Earth. For one, Schaffer is a notorious perfectionist who challenges and pushes his bandmates. Owens was ready for that. "Glenn (Tipton, of Judas Priest) was really demanding," Owens said with a laugh. "I'll probably never be worked that hard again, but it taught me a lot. John's the same way; he's a perfectionist." The second challenge is one faced by any newcomer - stepping out of the shadows of a vocalist that a lot of fans liked. After nearly a decade in Judas Priest, there's probably no one in the world more prepared for that than Owens. "I filled Rob Halford's shoes," he said. "Matt's good and everything, but when you go to a band where Rob Halford is the singer ..."
Owens, who provided a basis for the movie "Rock Star" (a very loose basis, according to him), thinks he'll quickly win over the Iced Earth fans, just as he did the Judas Priest fans, and he's looking forward to putting his stamp on some of the old songs on tour. But the one thing he's really excited about performing live is the 30-minute epic "Gettysburg," which tells the story of the famous Civil War battle. It's length is a bit prohibitive for a live show, but Owens thinks it has to be done in its entirety. "I think it will be pretty exciting live," he said. "I think it would be a nice change of pace because it's got really heavy parts in it and really melodramatic parts." Despite losing his position as frontman in one of the biggest metal bands of all time, Owens is happy with where he is now and excited about the possibilities for the future. He's ready to move forward, and holds no ill will for his old band. He remains a fan. "I'm really happy for them, and I think it's going to be awesome," he said. "Rob's the man, and this is a great situation for him. I think it's great to get them back for a 30-year reunion."